When we first began investigating the possibility of crossing the Sahara, we read tales of military escorts and convoys making their way through disputed Western Sahara and of 500 kilometers of muddy coastal piste through Mauritania, passable only at low tide in a sturdy 4x4 with the aid of an experienced local guide who might navigate at night, using the constellations as a guide. 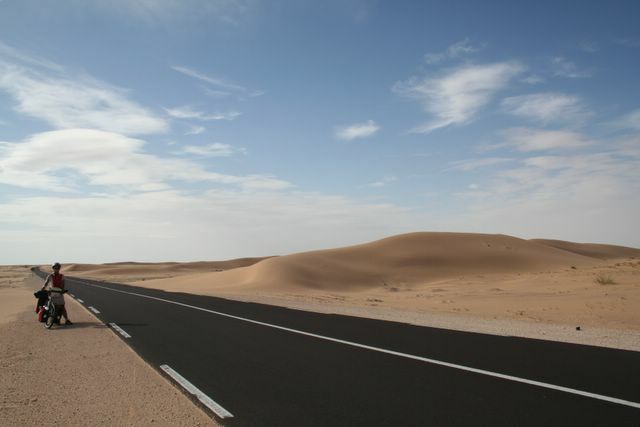 Nowadays, with the Moroccan military tightly controlling Western Sahara and the highway connecting Nouadhibou and Nouakchott finally finished, traversing the desert is a fairly routine affair. Nevertheless, we had our reservations. 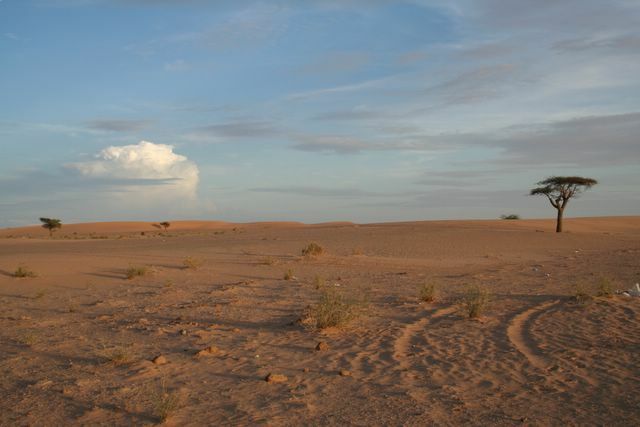 The region is sparsely populated with settlements (and sources of water) often more than 150 kilometers apart, the desolate landscape offers little shelter from the scorching sun and gusts of wind are known to sweep sand across the highway cutting visibility to near zero and wreaking havoc on contact lenses wearers. There was a certain temptation to hitch a ride on a truck headed south and be done with the desert in a matter of hours rather than days. Our first desert surprise came in the form of cloudy and foggy weather which made riding comfortably cool. Cool, that is, in comparison with the 40+ temperatures we had endured in the Moroccan interior. The road out of Tan Tan followed the coast closely and we often hopped off the bikes to peer over the edge of steep cliffs that dropped quite spectacularly into the breakers of the Atlantic. The tang of the sea was invigorating and with the kilometers passing by quickly thanks to smooth, flat roads and a gentle tailwind, morale was high. But at some point, boredom set in and it seemed the counter turned ever slower and slower. Time to think up new distractions such as determining the most popular brand of mineral water by analyzing the empty bottles which littered the roadside (Sidi Ali is clearly more popular than Ciel). Brushing up on little-used elementary school math was also time well spent. Something like 'If Amaya continues to cycle at 27 KM per hour and her destination is 87 kilometers away, what time will she arrive? ' And the old standby, fantasizing about food 'If I could shop at a well-stocked supermarket what would I buy? After Tan Tan came the one-road town of Akhfenir where we had our first taste of the delicious fresh seafood available throughout the region. Then it was on to sleepy Tarfaya whose only claim to fame is having been one of Antoine de Saint-Exupéry's stopovers when he was a pilot for the Aéropostale in the 1920's. It was hard to imagine the author of The Little Prince finding inspiration in such a place. Apart from the paved main street with its brightly-lit restaurants and exceptionally good bakery, the town was a sandy conglomeration of half-finished concrete structures and dilapidated buildings from the colonial period. There were barefoot and bare-bottomed toddlers tossing a ball about in the dust, oblivious to the dangers of the passing donkey carts and noxious fumes being sputtered out by the patched-up vehicles which raced by kicking up a storm of sand in their wake. We were directed to the town's one hotel, which surely welcomed far more sailors than foreign tourists. Warm croissants got us off to a good start the next morning and by noon we were in Western Sahara's main city, Laayoune. The ongoing conflict in the region means there is a strong United Nations and Moroccan military presence in the town . Several police checks before entering the city (they seemed most interested in our professions), loads of Toyota Land rovers speeding past with UN emblazoned on the side and expats hanging around the internet cafés. As Eric was checking in at the main post office to see if a package he was expecting had arrived (it hadn't) he got into a heated debate about Saharan politics with a fellow client. Later that afternoon we ran into the gentleman again just outside our hotel and, as we were chatting, a police van pulled up. After a brief exchange of words, the officers whisked the man away despite Eric's assurances that everything was in order. Maybe all those UN Observers should spend more time checking out what's going on in the streets and less time observing what's happening in the city's posh hotels. On our way out of town the next morning we caught sight of our first camels, albeit in the back of a pick-up truck. During our ride through Western Sahara we passed several villages, obviously newly-constructed with street lamps, and tidy-looking lanes, the buildings painted in soft pastel hues, but never a person in sight. These phantom villages, plopped down in the middle of the desert, really baffled us. One evening as we were stocking up on supplies for the following day (canned tuna fish, processed cheese and the like), we met the caretaker of one such village who cleared up the matter for us. The Moroccan government had constructed the villages for an expected influx of Saharan refugees returning from camps in Algeria. The refugees haven't returned and entire villages, complete with schools and mosques, lie empty. Down the coast and through the desert we continued, stopping three days later in Dakhla for a rest before the final stretch into Mauritania. There were lots of vehicles with European license plates heading in our direction, but these were not your typical tourists. Cars are a lucrative business in these parts and a late model Mercedes can command a good price in West Africa. We met many French people who made a living this way, driving down through Europe and Morocco several times a year and then selling their auto in Mauritania or Senegal and then flying back home. Supplemental income, we were told, could be made by hawking a few bottles of wine on the side or other hard-to-come-by items such as perfume or even deodorant. Four kilometers of heavily mined No Man's Land separate Mauritania from Morocco. We were advised to stay on the rough dirt track and shoot straight for the huts housing customs on the other side. Off to the left was a large group of cars--those without the proper papers (ie stolen) were haggled over here and then brought into the country after a little palm greasing. With a fair amount of pushing through the deep sand we made it to the Mauritanian side and were greeted by two exceedingly friendly immigration officers who immediately filled our numerous bottles with much needed water. While we were waiting for our personal details to be recorded in a very official-looking ledger we met Fabrice, who was traveling in the other direction, back to France with his new Senegalese wife. She had been turned back at the border just a few months ago due to a new law requiring citizens of Senegal (and many other sub-Saharan countries) to enter Europe by air only. This in an attempt to stem the tide of immigrants seeking a better life further north. For Fabrice and his bride it just meant a lot of hassles and dealings with officialdom in order to receive authorization for her to enter Europe by land. We thought traveling through some of Asia and Latin America's poorest and most chaotic cities (Calcutta and Tegucigalpa, Honduras come to mind) would have prepared us for anything full-on Africa had to offer. Not so. 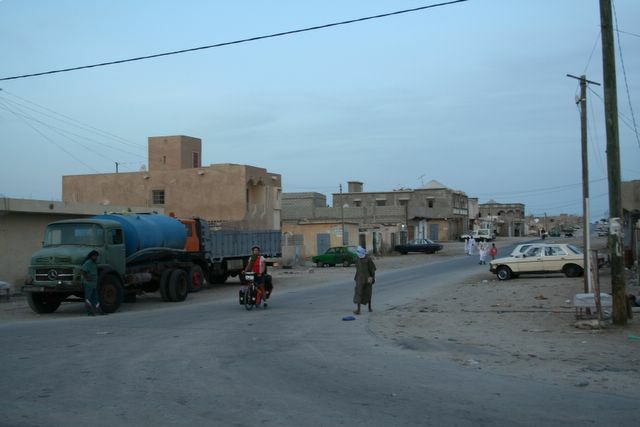 Nouadhibou, Mauritania's second city and economic capital, came as a shock. The city is depressingly run-down and the town center, with goats doing the only garbage pick up, ranks just above a shantytown. Everyone on the road seemed to be in a hurry with drivers impatiently tooting the horns of their patchwork Mercedes and vehicles veering on to the sandy shoulder of the road to pass each other. Quite a scary place to be cycling. Rusting ships litter the harbor and abandoned warehouses and plants dot the outskirts of town. It was Africa overload for us and we took refuge in a quiet auberge run by Senegalese immigrants Momo and Fanta and didn't venture out until the following afternoon when we went looking for lunch. At the restaurant recommended in the guidebook, we were told to take a stroll through town and come back in an hour or so (it was 12:30 at the time) when the daily meal would be ready. Taking a stroll through Nouadhibou (to see the sights???) was the last thing on earth we wanted to do. Sensing our hesitation, one of the employees offered to lead us to his sister's restaurant just around the corner. It was a little hole in the wall, but spotlessly clean and cheerfully decorated and the simple meal of spicy rice and fish was delicious. When we went to pay, however, we realized that we had 'invited' our guide to dine with us and that 'sister' was used in the loosest of senses. As we left town the next morning the smell of fresh bread overpowered that of rotting rubbish and in the soft light the town took on a calmer aura. Maybe it wasn't such a bad place after all. 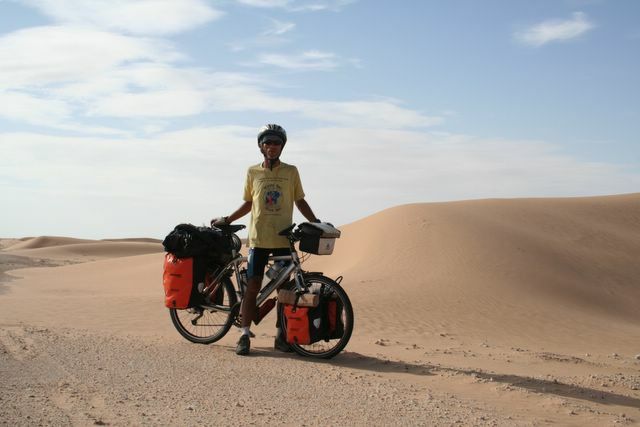 It was back to the dramatic desert for 470 more kilometers through Mauritania. September is the rainy season further south and this effects weather in the Sahara as well. For us, it meant a strong headwind that hampered progress and put a damper on the fun. Fortunately our extra efforts were compensated with fantastic scenery. 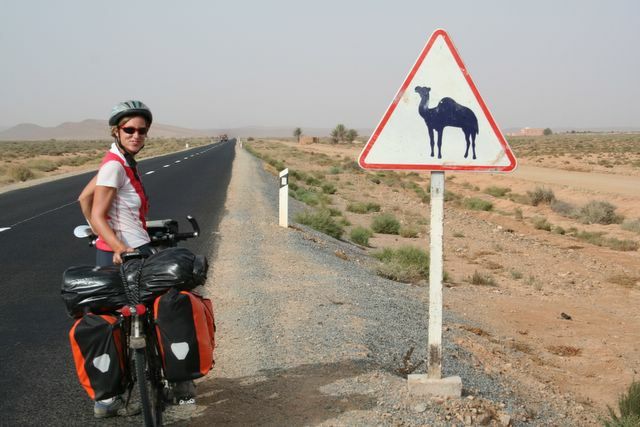 We had been relying heavily on Luke and Anna's (www.africabybike.org) detailed account of their overland crossing for information on the availability of food, water and accommodation. 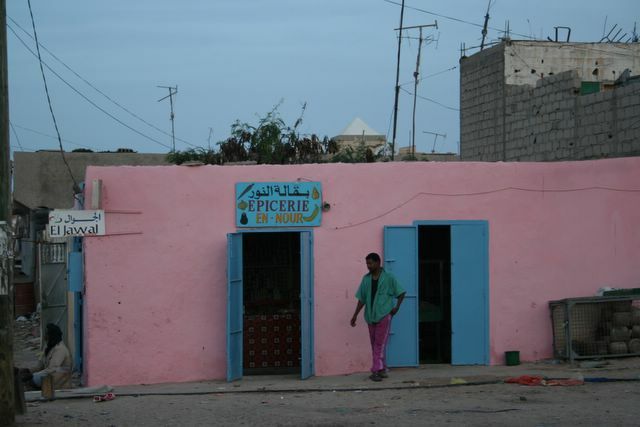 The Mauritania section mentioned several auberges (guesthouses) and lots of restaurants along the way. We briefly envisioned hot showers, soft mattresses and hearty meals. The 'auberges' in question were nothing more than canvas tents with mats on the ground to keep out the sand and a few pillows for comfort. All that was required to open a 'restaurant' was to get a sign made and stick it in front of a tent and wait for customers to show up. 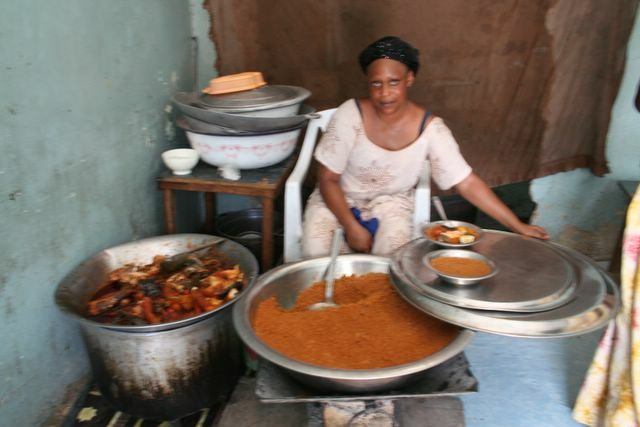 Then the proprietor could worry about rustling up something to eat for the hungry clients. We regretted not stocking up better on provisions, as all that could be found along the way was overpriced canned food and not even a loaf of bread or egg could be had. 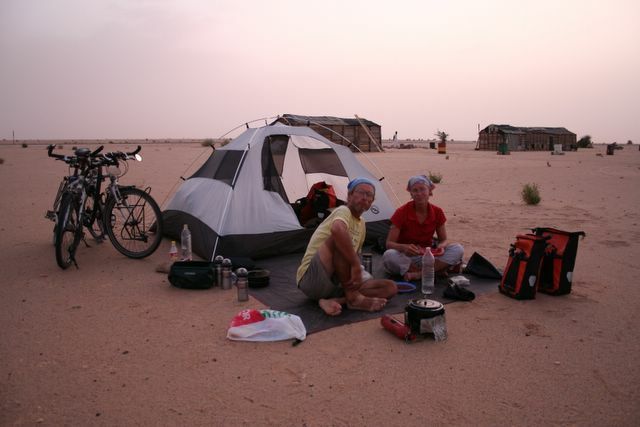 Our first night was spent camping chez Ahmed, who used to make a living guiding foreigners on the treacherous piste between Nouadhibou and Nouakchott and whose source of income had dried up with the completion of the highway. Being an industrious young man, he decided to use his navigational skills (the best GPS lies in the head, he says) to transport 'unlicensed vehicles' to the capital via the off-road track, thus avoiding customs officials and police roadblocks. Apparently he makes quite a good living this way, earning the equivalent of 500 euros for each vehicle brought to Nouakchott. Cheir, an astute businessman masquerading as a simple camel herder, and his family welcomed us the next night. Since the completion of the highway, life had changed a dramatically for the family. They had moved four kilometers inland from the old piste and opened up a shop and a small restaurant beside the new highway which supplemented Cheir's income from selling camel's milk. He had been able to set aside 13,000 euros and was looking for a business partner in Europe. !3,000 euros seemed like quite a large amount for a country with a GDP of just 345 dollars per inhabitant, but when one charges seven times the going price for a meal (as we found out when it came time to pay up) profits must add up quickly. But he was an affable man and the camel's milk he offered us for our corn flakes was tasty, so we quickly forgave him for the price gouging. Before heading off to bed, Cheir warned us that their might be rain. We dismissed this as pure wishful thinking on his part, despite the tell-tale sign of a covered sky. Around midnight we were awoken by gusts of wind sweeping sand into the tent (minus the rain fly, of course) and within minutes we were in the midst of a torrential rain. In a flurry we fumbled to attach the fly and avoid flooding the tent. We were mildly successful, but sand and rain is a disastrous combination and all our possessions were covered in a thick layer of grime. 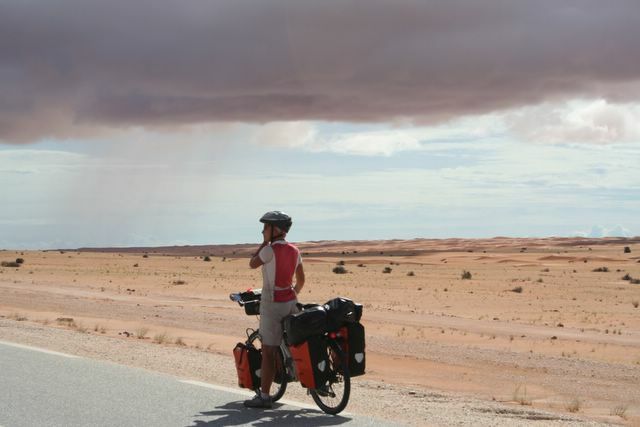 Continued headwinds and stormy weather meant our planned 3-day ride to Nouakchott turned into four. We treated ourselves to a stay in one of the 'Auberges' on the final evening as the damp and smelly tent hardly sounded inviting after a tough day battling the winds. Luck was with us for the last 100 kilometers. 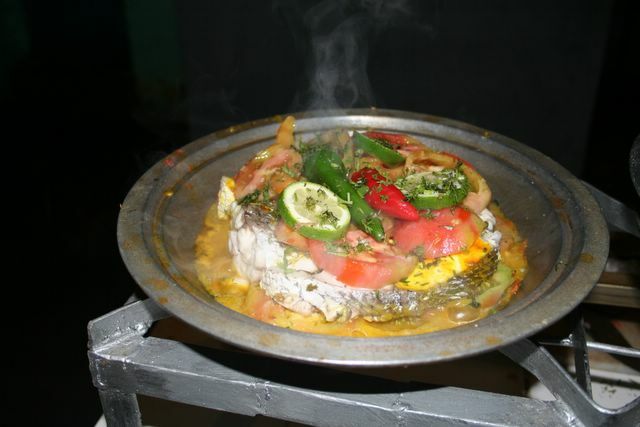 The wind had changed and we rolled effortlessly into the capital in time for spicy rice and fish for lunch. The goats were out at work cleaning the town, but they weren't doing a very good job with the plastic bottles which were accumulating in large mounds by the side of the road. Nouakchott won't make it into the top 1,000 tourist destinations in the near future, but it is a step above Nouadhibou in terms of cleanliness and calm. It' not an easy country to survive in. 50% of the population lives under the poverty line, the economy is vulnerable to fluctuations in the price of iron ore, overfishing has depleted stocks and given the very limited industry and arable land, almost all products and many foodstuffs are imported. But based on purely anecdotal evidence, the parallel economy is thriving. Mauritanians are go-getters with a keen sense of business and a desire to improve their situation. And things are looking up these days. The new government --under pressure from the IMF- has opted for economic liberalization and oil has been discovered offshore. Mauritania, unlike Morocco which is so European in many respects, feels like Africa. It moves to a special beat and there's a feeling of hope in the air despite the overwhelming poverty. It's painfully clear to us that there are many facets to the continent and we've only just begun to scratch the surface. The worst of the lonely desert is behind us now. 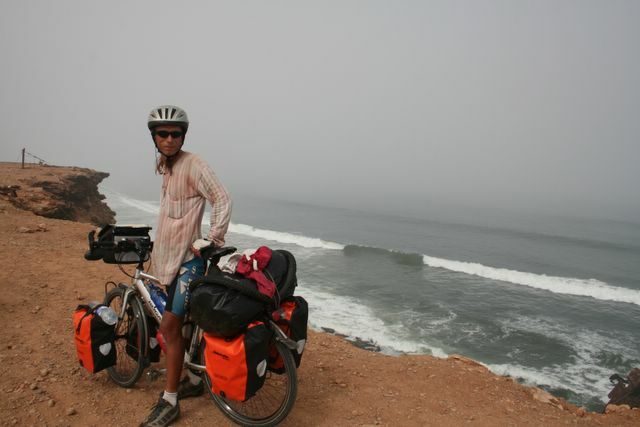 Just 200 kilometers and we'll be in the fertile region surrounding the Senegal River. New challenges await us. The rainy season is in full-swing, so surely we'll have reports of downpours and dampness in our next update. If you'd like to help educate African girls, please consider making a contribution to our charity of choice, CAMFED. African girls have fewer opportunities for schooling than any group on earth, yet without an educated generation of females the continent will never be able to put an end to poverty and dependence on foreign aid. CAMFED supports girls and is in the process of creating a virtuous circle of education and opportunity. Contributions can be made online here.